Have a quick Update Status for you all. Due to Day Job scheduling, I won’t be able to have a Friday comic this week. Sorry for the delay, and I’ll see you all on Monday! Octopus intellect studies can be kind of trippy. They're capable of a lot of cleverness and deduction,and some studies even show signs of emotive states. Although, I also enjoy tentacle sushi. I'm kind of a monster that way. Time to look up Parry Gripp’s “Little Octopus Climbing Over Rock” (on YouTube). I ams the terrors that swims ins the nights. Now look what you’ve done. I went and looked up that video, and 20 minutes later I’m watching a video of that Morgan Freeman-soundalike guy describing the biological functions of sea pigs instead of finishing my taxes. Beware YouTube recommendations given on the Ides of… April? I think the Ides of April was Monday, actually. Sometimes it’s the 13th, and sometimes the 15th. OH NO! Not frowny-faces! Anything but that! I think it’s awesome that Mina’s threat of frowny faces is so effective. It’s a good reminder how how young these kids really are. Neither of us thought to ask where. That’s better than what my dad would do for long road trips; put a paddle between me and my brother with the threat that if anyone crosses the paddle, they get the paddle! Tako the Octopus is my favorite TV chef, too. octopus brains, nervous systems, and sensory equipment are radically different from mammalian ones. they are probably the closest thing we have to a true alien intelligence. And we’re nowhere near being able to communicate with them. Off the island of Capri it has been seen for the first time…ever older octopus surviving and shown teaching the hatchlings what they have learned over their lives. This is one important facet of the cephelopod life that has stunted their intellectual growth since each new generation had to learn on its own every time. This might signal an evolutionary change that could lead to increase of intelligence and group activity. Also sign posts for a chance of sapient development. In one of my novels super intelligent evolved terrestrial octopi from the future comes back to communicate with us. They mainly use their fantastically changeable dermis to do so, but also calls as well. I’d go as far as to suggest that cephalopods like octopi and cuttlefish probably /are/ sophonts to at least some degree. They mainly seem to lack the lifespan to really develop the potential intellect they have, but even in the relatively short span during which most cephalopods live they arrive at a remarkable awareness of the world around them and the other nouns they share it with, including humans. Do you have any source on the mention you made of an older octopus teaching younger ones? I’d be keenly interested to read up on that, but I can’t find it offhand. Ahhh, that whole bunch, with the colour changing skin stuff, Gahh! Cuttlefish, squids, they are all aliens! Living in our seas and oceans! Fortunately they are tasty morsels! In Germany, I had calamari on my Pizza, Mmmm, yum, nom,nom! Calamari, Takoyaki, Nakji Bokkeum, Polbo á feira… how has Selkie not learned of the amazingness of eating Octopus? I feel like they live in a fly over state given how generic all the food has been. That or Todd still cant think in terms of meat. She should have been taken to a sushi place by now! They do veggie rolls for Todd! 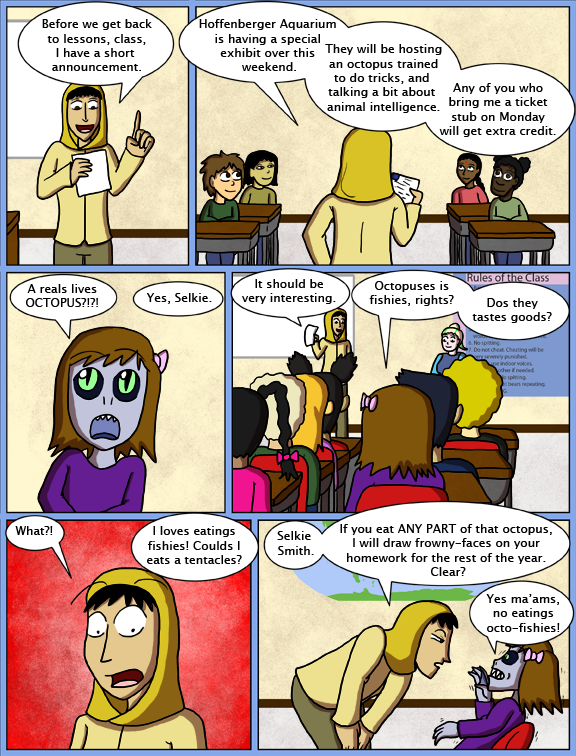 Why yes Selkie, octopus does taste good. Have your dad take you to a sushi restaurant, you can try it. Sushi would not be a good fit for Selkie since it contains rice or rice products. Sashimi may be more to her liking but I don’t think she’ll appreciate the small portions. Also, to the others, calamari refers to squid. She could get just the fish cuts. Any good place makes the sushi at time of request. I went with a friend that never tried sushi. He was aghast when I ignored the chopsticks and silverware and just ate with my hands until it was explained by the waitress that I wasn’t doing any faux pas’s. Very funny moment. You mean it’s not finger food? I thought so. And I don’t like sushi. Tried it twice. I just don’t like fish. Actually if you just order sashimi, you simply get fresh raw fish—no rice or rice products. It can be quite satisfying, too. Next time at a restaurant, order the calamari. See, eating of the octopus and its relatives is not really a moral dilemma; they are very smart and dexterous and color-change-y and occasionally they use tools, but there is also the fact that if we didn’t regularly cull and devour them, they might forget who’s boss and rise up against us. Are other people able to vote for Selkie on TWC or is it just me? The local Korean joint has an amazing Bibimbop with baby octopus… It’s a favorite of mine. Although, sometimes I cheat on that dish and have the squid… or Chicken Teriyaki because they make it perfectly. Yes, yes they do, there are many articles about how researchers are trying to learn from how cephalopods do that; in hopes it could help with healing people after amputations, and surgical procedures. Cooked sashimi tastes just like fish! Ooh! Are they going to see the octopus trained to take pictures? Because that was really cool. C’mon Selkie, you and I will go out to get us some octopus! Anyone else thinking about how Selkie and Amanda are going to run into each other possibly at the aquarium with their respective parents? I think you totally called it. THANK YOU! This is what I was thinking too, oh dear lord, this is going to be amazing! Here comes the excuse train. Soon enough we will be getting updates once a month. Yeah, I’m a total monster. Oh god, yeah please don’t worry about my thing if you’ve lost your job. That’s terrible, I’m so sorry. Feeling sick? Have a hankerchef to cry in. Some people have careers and need to work to take care of themselves and loved ones. But you go and cry. Selkie, never eat any animal that can do an amusing trick. Amusing tricks aren’t going to save the tasty from the hungry. Is nobody going to mention that, like Selkie, octopuses have blue blood? Probably from years of inbreeding. that last panel… she’s standing on Selkie’s desk, right? nah… it’s a “dolly zoom” used to get in for a close-up of the actor, yet getting the WHOLE background in the frame… Hitchcock used it very well. one of the things it does is distort the perspective to make it look like the camera is elsewhere… cool effect really. Copper based blood but unlike Mr. Spock’s, is not green. No Sashimi aka raw fish for me, I like my meat cooked. When I did eat tentacle it was nearly tasteless. Was disappointed. Someone should probably tell her octopi are pretty smart, too. And… do their tentacles really grow back? Um… I’ll have to look into that. Selkie may also get discouraged when she learns cephalopods (the larger family octopii belong to) are all salt water creatures. Freshwater Selkie would not enjoy a saltwater aquarium. The flavour would be very unpleasant immediately, and she probably would start choking to death after a few “breaths” allowed the salt to start building up in her lungs-equivalents. It occurs to me — this really isn’t fair to George, Tony, and Keisha. I don’t think the orphanage staff is able to bring any of the kids to the aquarium, so no matter what GT&K do, they won’t be able to get extra credit. My thoughts exactly. This really isn’t fair to the orphans or any less-privileged kids in the class whose parents don’t have time to take them to the exhibit, or just can’t afford it. Maybe they should have considered that before being orphans! So is it just me or have the Selkie and S&K updates been slow lately? Is something up? How lately are you referring too? If you mean yesterday and today, I (with much regret!) had to concede being able to do those updates due to Real Life Day Job issues. Yeah, thats what I was referring too. Hope everything gets sorted out!